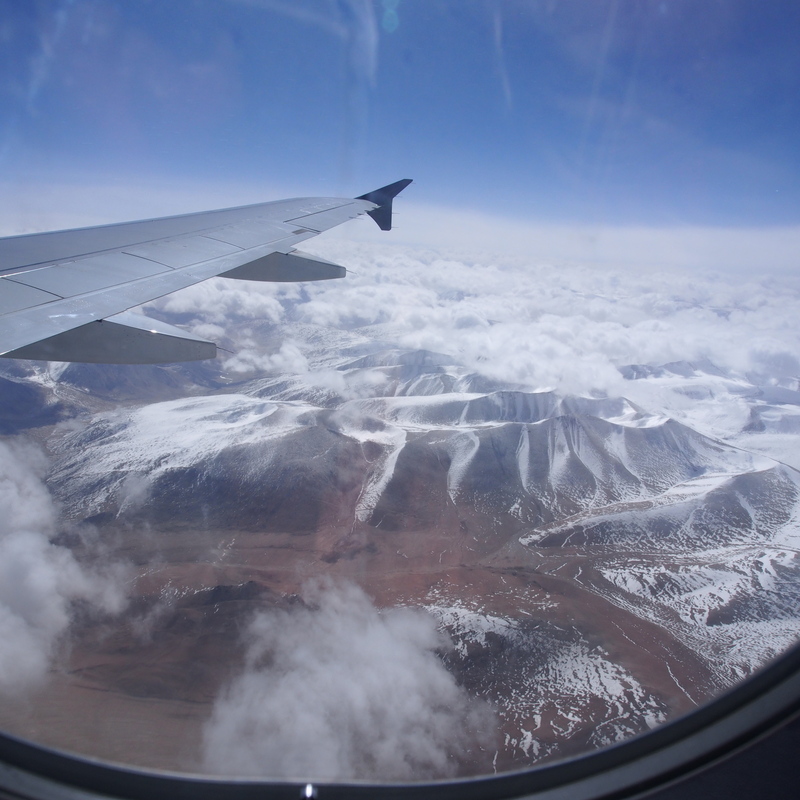 Our first glimpse of the Himilayas was through the window of the airplane going from Delhi to Leh, Ladakh. 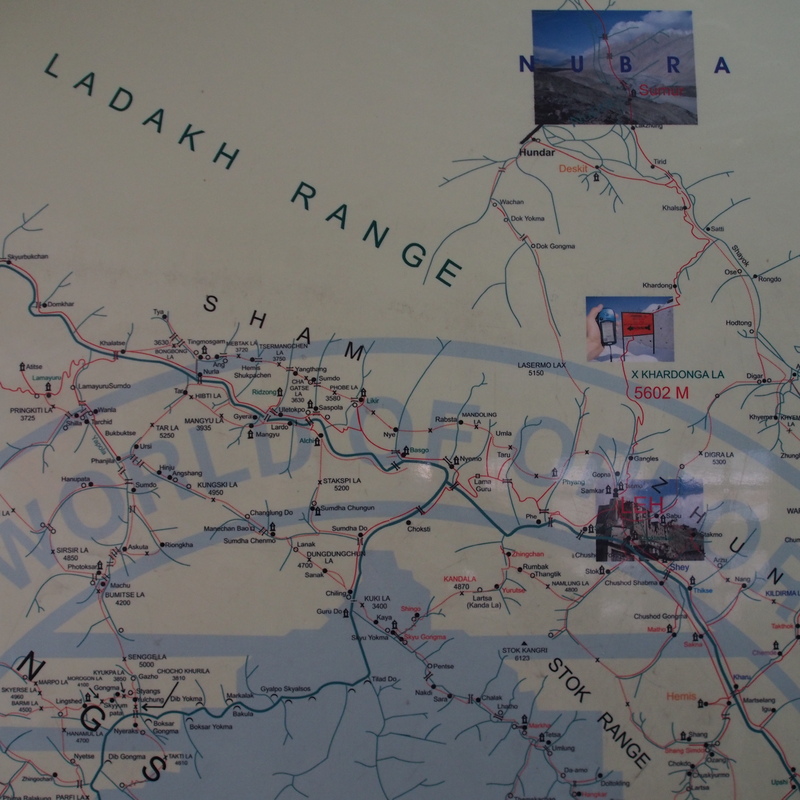 You will have to enlarge the photo of the area map to determine where we were headed and some of the areas we visited in Ladakh. 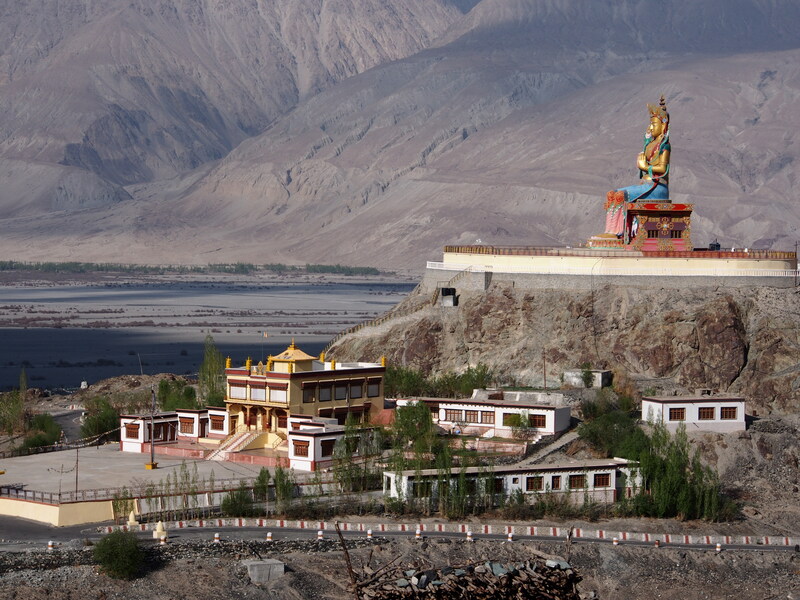 We have now been in Leh for a week with a three day trip to the Nubra Valley thrown in. We love the area despite the cold nighttime temperatures of -3. It is very early on in the tourist season and so it is quiet and cheaper. The snow still comes down to lower elevations and threatens road closures to the outside world and some of the fascinating places accessible within a days drive. 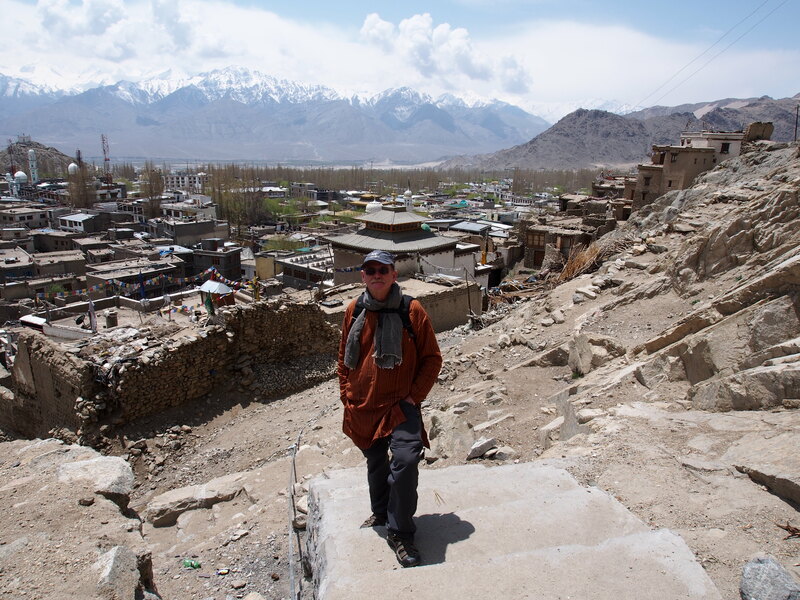 Despite the cold nighttime temperatures the valleys are starting to turn green and the planting and irrigation of the market gardens is a major local activity.The trip to the Nubra Valley was incredible. 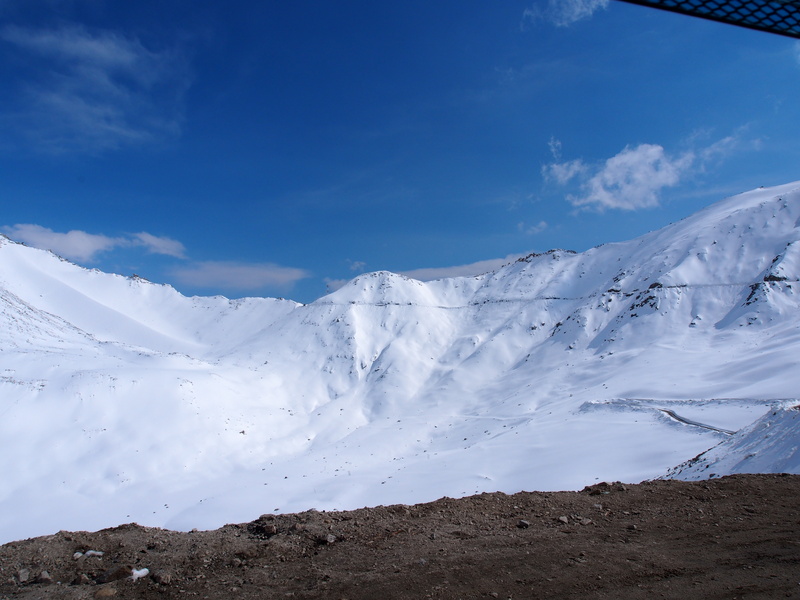 The picture above is of the pass, Khardung Pass, which we had to go over. Look carefully and you can see the road cut into the side of the mountain. The pass rises to 5,346 metres. Going to the Nubra Valley took ten hours and the return 12 hours. This was for a 160km trip! Both ways we had to use chains but on the return trip we were doing it in the dark. Fears of avalanches, rock slides, frezzing temperatures and mechanical breakdowns kept us all awake. Of course there are the incredible buddhas and buddhist monasteries scattered everywhere. Buddhism is the major religion of Ladakh but slowly losing out to the muslims. It is hard to get over the sheer scale of the landscape and their geological formations. It is too hard to translate into the written word and even pictures cannot translate the scope.The trip was made early in the season snow wise and as such caused a few anxious moments as we made the death defying crossing. It involved travelling by rented mini bus with two Italian women and a French couple. It is definitely not the road for the faint of heart. We thoroughly enjoyed almost every moment and it was worth the harrowing journey even to have only one free day once we were there. We could have stayed two weeks but are now glad we are back at the Jismet Guest House in Leh.Today we are just relaxing, doing laundry, soaking up the sunshine and planning dinner out with new found friends. It is still very quiet here in Leh with most of the tourists being of Indian origin as this period is the beginning of their major holiday season. There is a smattering of Italian, French and Australian. There are few americans and even fewer Canadians. I would not want to be here in July/August as judging from the number of hotels, restaurants and gift stores that are now closed it would be a tourist nightmare in high season. Like so many places where tourism plays a strong role the result is not appealing – Phuket being one of the more extreme examples. 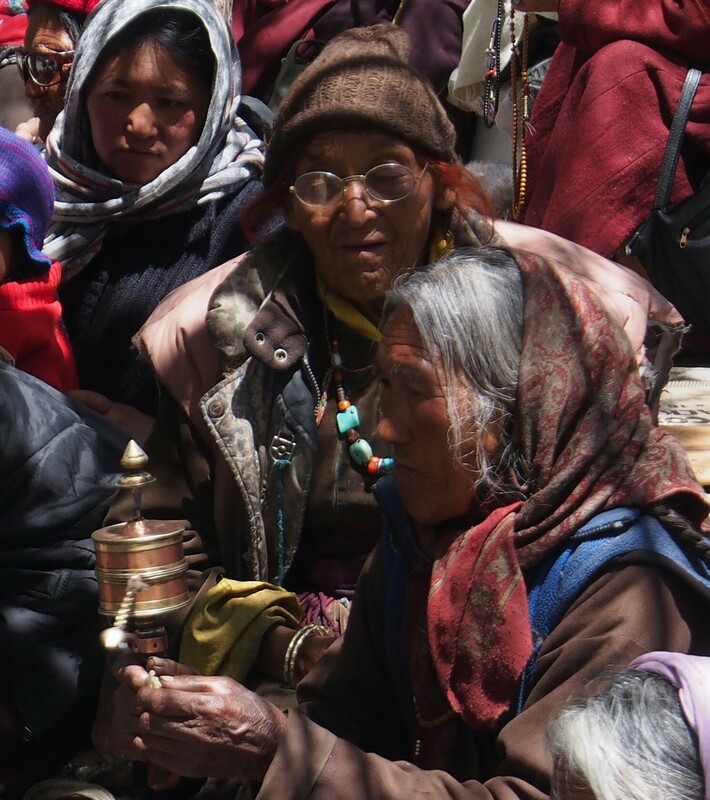 This was taken at the local temple in Leh when 800 monks gathered to celebrate Buddha’s birthday on May 5th. 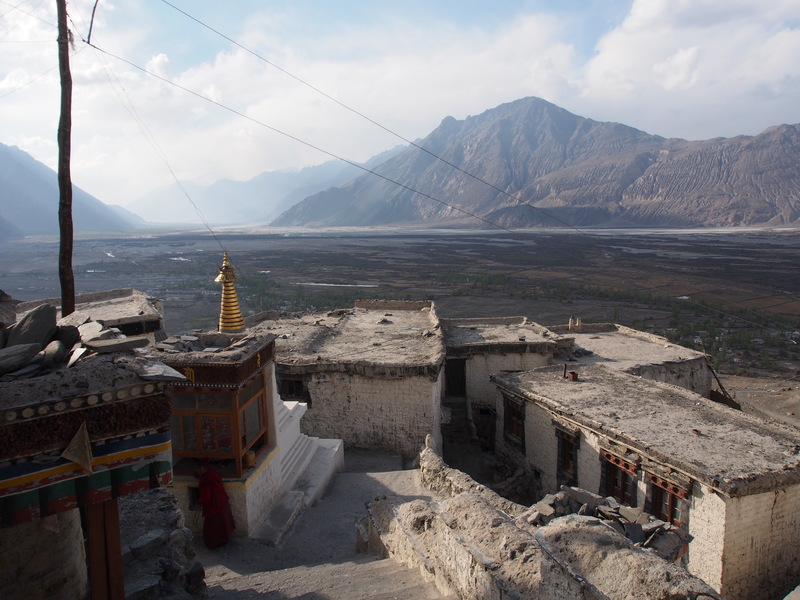 View of the Nubra Valley taken from the Diskit monastery. An exceptional chapter in your travels, mate. Stunning really, thanks. Wow. That’s all I can say. Wow. Wish I were there! I am not sure why this is a tourist destination?? It all looks pretty bleak to me… sorry I have to disagree with Wayne but I guess it is stunning in its desolation! It reminds me of the high Arctic.. not much there but tundra and rock.